Until data reporting on teacher shortages improves, teacher candidates will have “false impressions” about their job prospects, and policymakers will create broad solutions that fail to address states’ and districts’ specific needs, says a Bellwether Education Partners report released Wednesday. “The misalignment between teacher supply and demand is where the teacher shortage crisis is born and lives,” write authors and analysts Kaitlin Pennington McVey and Justin Trinidad, arguing that there is no “national, generic teaching shortage." The report, titled "Nuance in the Noise: The Complex Reality of Teacher Shortages," seeks to counter what the authors refer to as an “inaccurate narrative” in the public about shortages. “Shortages really are a state-by-state problem and challenge,” McVey said in an interview. 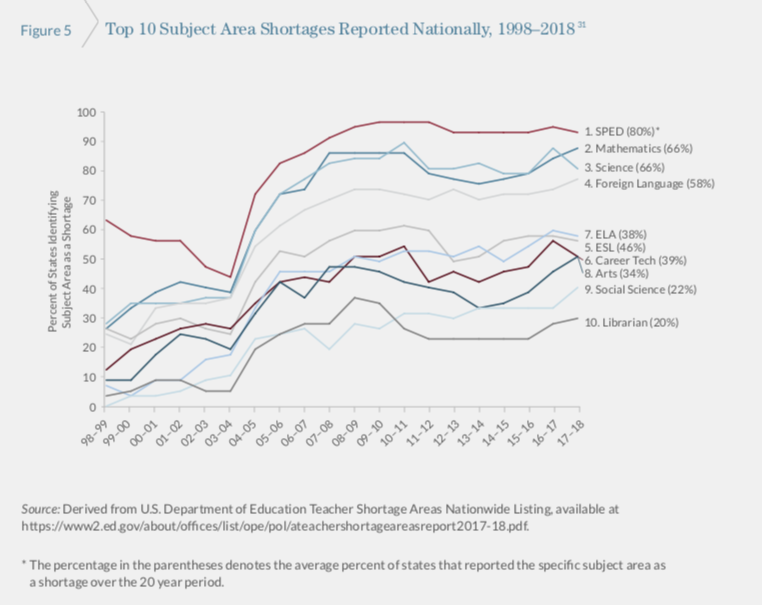 The researchers analyzed 20 years of data on teacher shortages that states submit to the U.S. Department of Education. But they note that there is no common framework states use to report the data, and what they do report doesn’t specify the extent of the problem, the report says. “States report that a subject area shortage exists, but they do not indicate how dire the shortage is — it may be one teacher or 100 teachers,” they write. The report also notes that beyond the most common subject areas where states report shortages — special education, mathematics, science, foreign language and English as a Second Language (ESL) — there is little consistency in the types of teachers that states and districts need the most. For their analysis, they created 25 categories and used a state-by-state breakdown that shows the percentage of years, between 1998 and 2018, during which states reported shortages in specific subject areas. In some sections, they found shortages that tend to get less attention, such as career and technical education and foreign language. The Bellwether report also shows that schools in poor and “under-resourced” communities and those serving higher proportions of minority students are hit hardest by a lack of well-qualified teachers. "Teacher shortages in the United States are widespread but vary from school to school and district to district," Linda Darling-Hammond, president and CEO of Learning Policy Institute — which has released several reports on the issue — said in a statement. "Shortage rates are highest in schools serving low-income students and students of color and in subject ares that include mathematics, science and special education. Consistent data gathering across states would help to better understand and address this problem." The graph shows the subject areas where states say they have the most shortages. The national conversation around teacher shortages often focuses on the decline of college students going into teacher preparation programs, but the number of students completing degrees in education still outpaces the number of classrooms that need teachers, the Bellwether authors write. Though there has long been a glut of teachers certified to teach elementary grades, many graduates with education degrees decide not to go into teaching. The report also discusses policies aimed at addressing shortages, as a recent LPI report also did. McVey and Trinidad note that while a variety of loan forgiveness programs exist, for example, there is some research to suggest the amount forgiven may need to be higher to recruit or retain teachers in certain categories. Differential pay — creating salary incentives for teachers to work in high-needs schools or hard-to-staff subject areas — can also be an effective strategy if the incentive is large enough, the report says. The pending teachers’ strike in Denver, however, shows that a system that doesn’t clearly articulate the connection between a teacher’s performance or accomplishments and the available bonuses can cause frustration. Another “easy one,” McVey said, is for states to remove barriers that prevent teachers that were licensed in one state to work in another. The authors call for a more ”robust data system” so states and districts can better communicate with teacher preparation programs to address specific needs. "Policy solutions for addressing shortage areas exist," the authors write, "but states lack the ability to diagnose teacher shortage problems unique to local context due to opaque, out-of-date teacher shortage data."